The home automation system market is expected to be valued at USD 79.57 billion by 2022, growing at a CAGR of 11.3% between 2017 and 2022, a recent report by MarketsandMarkets has forecast. The key driving factors for the growth of the home automation system market are the growth in IoT, cost reduction measures, large number of manufacturers widening their product portfolios, and increasing importance of remote home monitoring. The proactive segment is expected to hold the largest size of the home automation system market during the forecast period. Proactive solutions are specifically designed to enable consumers to understand energy patterns and take effective measures to reduce their consumption. Proactive solutions are more beneficial as they can also send recommendation signals to end users for taking necessary energy reduction actions and can then control the electronic devices based on the users’ actions. The HeatSave wireless thermostatic radiator valves grant users a superior level of control over their heating zones and radiators, while also enabling users to slash up to 30 percent off their heating bills. They are extremely easy to set-up and install, since users will only have to unscrew the existing TRV by hand and replace with the HeatSave wireless radiator valve. 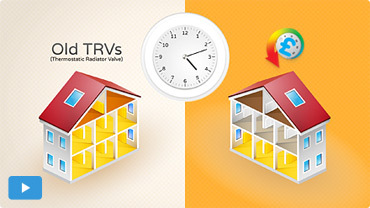 Moreover, HeatSave TRVs can be controlled directly by the HeatingSave Building Management System (BMS). The HeatingSave BMS will monitor indoor and outdoor environmental factors and energy usage and optimize the way the household’s heating system is being used in order to slash energy bills. If you want to find out more about the HeatSave wireless thermostatic valves, just contact our dedicated product team.